An event that can be called a “dress rehearsal” of future official celebrations that will be held not only in Ukraine, but abroad as well, took place at the Mykola Lysenko Memorial House (part of the Museum of Prominent Figures of Ukrainian Culture, 97 Saksahansky Str.). Kyivites are familiar with the exhibit of the museum dedicated to the prominent Ukrainian composer, public and culture activist Mykola Lysenko. Unique items from composer’s archives, memorial belongings that were given by his descendants, are presented here. Authentic floors, moulding, tile stoves have been preserved here. This is the place where Lysenko lived until his death in 1912. A part of his collection of Ukrainian folk musical instruments (lyre, torban, cymbals, kobza) is exposed on the walls of his office. Here Lysenko worked on his operas Taras Bulba, Eneida, Nocturn, and last issues of Music for Kobzar. Traditionally, during these memorial days, the classic’s music is performed in this house. 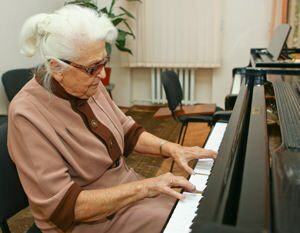 Rada Lysenko, artist’s granddaughter, piano player and teacher at the National Music Academy of Ukraine, plays it. Rada told The Day about the plans for the double anniversary (170 years since Lysenko’s birth and 100 years since his death), about family traditions, legendary grandfather, and about herself. CLASSIC MUSIC HAS TO REMAIN CLASSIC! We met Rada Lysenko at the National Music Academy of Ukraine in a class where she gives piano lessons. She has celebrated her 90th birthday this year, but she still continues her pedagogic work. We were present during one lesson and admired the wonderful duet performance by the pedagogue and her student, postgraduate from China, Sin Sin Ma. “Sin Sin came to me after she graduated from the conservatory,” Rada Lysenko started the conversation. “She is from China. She has been studying in Ukraine at the Mykola Lysenko school since the 7th grade. When she found out that I am a granddaughter of the outstanding composer, she asked me for some music by my grandfather. She learned it so fast and played it so skillfully, that I offered her to take part in Mykola Lysenko Contest. We shall celebrate Mykola Lysenko’s double anniversary in 2012: 170 years from the date he was born in and 100 years since he deceased. “I studied at the Kyiv Music Conservatory in Professor Abram Lufer’s class, who was a chancellor at that time. Heinrich Neuhaus was our degree examinator. He was from Kirovohrad and loved Ukraine tremendously,” Rada Lysenko recollects. “I dreamt to be taught by him ever since I was a child. Neuhaus noticed me at the exam, and he told the teachers about it, but I felt embarrassed to come up to him. I fi-nished the conservatory after the war, besides, I lost three years. During the war we were taken away from Kyiv. They put us on a train and sent to Germany. But we ran away in Lviv. We found an organization that helped refugees: it accomodated people and fed them twice a day. Lysenko’s last name was an icon for Lviv citizens! “My parents talked about my grandfather often. He was a public activist, he spent a lot of time on this. He had two university degrees: a Russian one and a West European one. Mykola Lysenko had a gift to persuade people. He had a lot of friends: his cousin Starytsky, Lesia Ukrainka, who was a frequent guest at the Lysenko house, her mother, Olena Pchilka, bandura players. Mykola Lysenko composed at night, because he had to teach during The Day. And not because he had a calling for pedagogy, but because he had a family to support. Though it would be so much better if he had spent more time on composing. Lysenko taught girls from the Intsitute for Noble Maidens. Then he donated money for the school construction. My grandfater was a choir conductor, went on tours with it. By the way, he adored the choir greatly. Our family preserves the traditions. My mother was from Poltava. She loved to sing and knew a lot of songs. We sang duets quite often. My daughter Natalia continues our music dynasty: she teaches at the National Music Academy of Ukraine. She used to be great at painting when she was a child. We started to teach her how to paint, but music won over. My grandson’s older daughter also plays grand piano. So music traditions, started by my grandfather, are kept in the family.